With more than 20 active local arts organizations, Gainesville and Hall County offer an exciting array of theater and symphony, art exhibits and cultural programs. The Chamber’s VISION 2030 initiative founded a Public Art Initiative with over 30 pieces of art located throughout the community. There is a commitment to build on the region’s love of all forms of art, and there is public art displayed in accessible and visual areas across our community. The Arts Council, Inc. serves as a hub for the Northeast Georgia art community. Contact: (770) 534-2787. 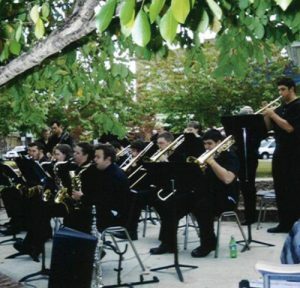 The Gainesville Symphony Orchestra is Northeast Georgia’s regional 70-piece professional orchestra. The group presents four concerts each season including the favored “Patriotic Pops Concert” each July 3rd at Brenau University Amphitheater. Contact: (770) 532-5727. The Gainesville Ballet Company stages an annual perfo rmance season, including The Nutcracker at Christmas and a repertory performance in the spring to give ballet students an opportunity to perform with guest artists. Contact: (770) 532-4241. The Gainesville Theatre Alliance is a cooperative venture joining the theatre programs of the University of North Georgia, Brenau University, a professional company and the community for a truly enriching Georgia culture opportunity. Four productions are staged annually. Contact: (770) 718-3624. TheVoices of North Georgia is a community chorus presenting a variety of music of high artistic quality to the people of Gainesville and North Georgia. They annually present the Christmas portion of Handel’s Messiah, and three to four concert weekends each season. Located on the Brenau University campus, Northeast Georgia History Center is a not for profit institution dedicated to promoting and displaying historical artifacts and displays from the Northeast Georgia area from the past 150 years. Contact: (770) 297-5900. The Quinlan Visual Arts Center is a comprehensive visual arts and education center offering art classes and workshops. The galleries of the Quinlan Arts Center are dedicated to monthly exhibitions of local, regional and international artists. Contact: (770) 536-2575. Additional Georgia arts and culture programs and galleries exist at both the University of North Georgia Gainesville Campus and Brenau University.